I am back! I feel like it's been forever since I blogged. How have you all been doing? I was not able to take my outfits pictures and blog cos I misplaced my camera for about 2 weeks. It was in my home but I was too busy with school to take the time to look for it. I have tons of outfits to share in next upcoming posts. It's finally Fall season and I have so excited but sad that summer is over. It's been getting cooler here in the DMV weather, so I am gradually bringing out my fall sweaters and booties. 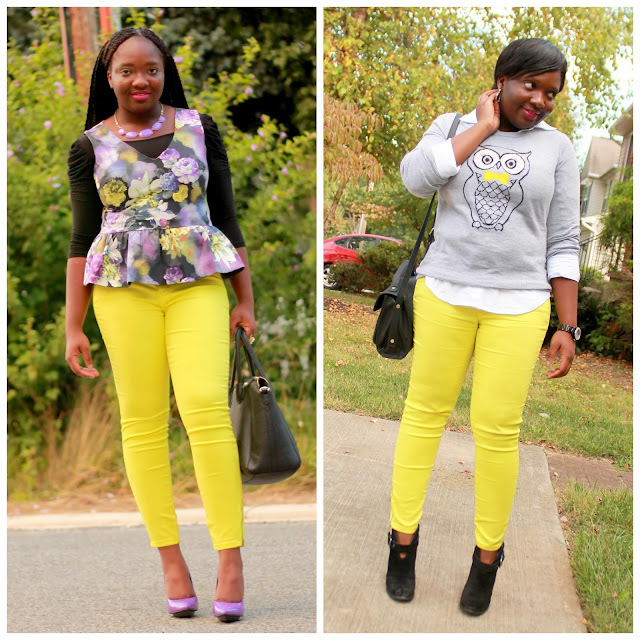 For this outfit I transitioned my neon pants from summer to fall by layering a white shirt under a quirky graphic sweater. I completed the look with a cross-body bag and a pair of black booties. These Booties are from the new Luxe Collection from Justfab. The collection is different from the regular collection since they are made from genuine suede and leather. If you are looking to buy a pair of affordable leather or suede boots, pumps and booties, look no further. Checkout the Justfab Luxe collection, not only are the price on point but the quality of the shoes are beyond awesome. I adore this outfit, I would totally wear everything! Gorgeous! Luv your outfit. I had to have this sweater too. This is a very cute look, good job!